Cavita is a sans serif typeface created by Vicente Lamónaca and published by TipoType that is a combination between both grotesque and calligraphic models with some particularities. It has both a grotesque touch and one calligraphic. This contemporary font is available in 7 weights and their italics and it has particular shapes and rhythm. Also horizontal stroke are triker that usual…makes it perfect for diplay, magazine, poster, text etc. 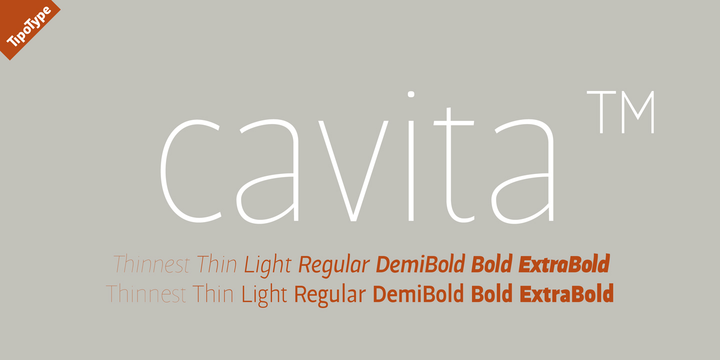 Note: “Cavita” is a trademark of TypoType. A font description published on Thursday, February 12th, 2015 in Fonts, TipoType, Vicente Lamonaca by Alexandra that has 3,427 views.